NASA WALLOPS FLIGHT FACILITY, VA – Investigators probing the Antares launch disaster are focusing on clues pointing to a failure in the first stage propulsion system that resulted in a loss of thrust and explosive mid-air destruction of the commercial rocket moments after liftoff from NASA’s Wallops Flight Facility, VA, at 6:22 p.m. EDT on Tuesday, October 28. The highly anticipated first night launch of the Orbital Sciences Corp. privately developed Antares rocket blasted off nominally and ascended for about 15 seconds until a rapid fire series of sudden and totally unexpected loud explosions sent shock waves reverberating all around the launch site and surroundings for miles and the rocket was quickly consumed in a raging fireball. The 14 story Antares rocket is a two stage vehicle. The liquid fueled first stage is filled with about 550,000 pounds (250,000 kg) of Liquid Oxygen and Refined Petroleum (LOX/RP) and powered by a pair of AJ26 engines originally manufactured some 40 years ago in the then Soviet Union and designated as the NK-33. Earlier this year an AJ26 engine failed and exploded during acceptance testing on May 22, 2014, at NASA’s Stennis Space Center in Mississippi. An extensive analysis and recheck by Orbital Sciences was conducted to clear this pair for flight. Numerous photos and videos from myself (see herein) and many others clearly show a violent explosion emanating from the base of the two stage rocket. The remainder of the first stage and the entire upper stage was clearly intact at that point. 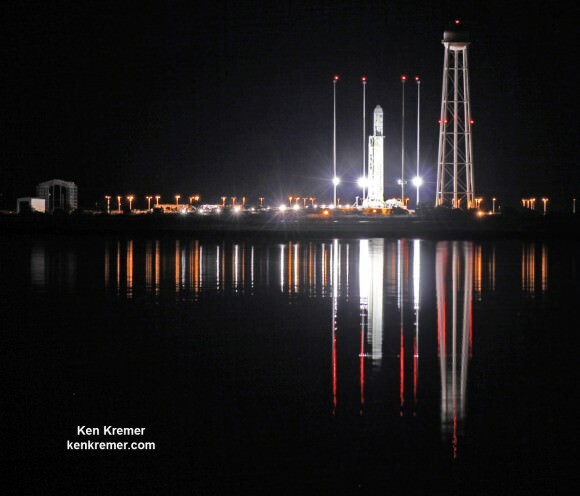 NASA announced that Orbital Sciences is leading the investigation into the rocket failure and quickly appointed an Accident Investigation Board (AIB) chaired by David Steffy, Chief Engineer of Orbital’s Advanced Programs Group. The AIB is working under the oversight of the Federal Aviation Administration (FAA). “Evidence suggests the failure initiated in the first stage after which the vehicle lost its propulsive capability and fell back to the ground impacting near, but not on, the launch pad,” Orbital said in a statement. At the post launch disaster briefing at NASA Wallops, I asked Frank Culbertson, Orbital’s Executive Vice President and General Manager of its Advanced Programs Group, to provide any specifics of the sequence of events and failure, a timeline of events, and whether the engines failed. “The ascent stopped, there was disassembly of the first stage, and then it fell to Earth. The way the accident investigation proceeds is we lock down all the data [after the accident]. Then we go through a very methodical process to recreate the data and evaluate it. We need time to look at what failed from both a video and telemetry standpoint,” Culbertson told Universe Today. The rocket telemetry has now been released to the accident investigation board. “Our engineers presented a very quick look assessment to the Accident Investigation Board at the end of the day. It appears the Antares vehicle had a nominal pre-launch and launch sequence with no issues noted,” Orbital said in a statement. Blastoff of the 14 story Antares rocket took place from the beachside Launch Pad 0A at the Mid-Atlantic Regional Spaceport (MARS) at NASA Wallops situated on the eastern shore of Virginia. After the failure occurred the rocket fell back to the ground near, but not on top of, the launch pad. “Prior to impacting the ground, the rocket’s Flight Termination System was engaged by the designated official in the Wallops Range Control Center,” said Orbital. Since the rocket impacted just north of the pad, that damage was not as bad as initially feared. From a public viewing area about two miles away, I captured some side views of the pad complex and damage it sustained. Check out the details of my assessment in my prior article and exclusive photos showing some clearly discernible damage to the Antares rocket launch pad – here. The doomed mission was bound for the International Space Station (ISS) on a flight to bring up some 5000 pounds of (2200 kg) of science experiments, research instruments, crew provisions, spare parts, and spacewalk and computer equipment and gear on a critical resupply mission in the Cygnus resupply ship bound for the International Space Station (ISS). Among the top tasks of the AIB are “developing a ‘fault tree’ and a timeline of the important events during the launch sequence,” using the large volume of data available. “We will analyze the telemetry. We have reams of data and telemetry that come down during launch and we will be analyzing that carefully to see if we can determine exactly the sequence of events, what went wrong, and then what we can do to fix it,” said Culbertson. The accident team is also gathering and evaluating launch site debris. “Over the weekend, Orbital’s Wallops-based Antares personnel continued to identify, catalogue, secure, and geolocate debris found at the launch site in order to preserve physical evidence and provide a record of the launch site following the mishap that will be useful for the AIB’s analysis and determination of what caused the Antares launch failure,” said Orbital. Culberston expressed Orbital’s regret for the launch failure. Culbertson emphasized that Orbital will fix the problem and move forward. Culbertson noted that the public should not touch any rocket debris found. At this point the future is unclear. NASA WALLOPS FLIGHT FACILITY, VA – Moments after a seemingly glorious liftoff, an Orbital Sciences Corp. commercial Antares rocket suffered a catastrophic failure and exploded into a spectacular aerial fireball over the launch pad at NASA’s Wallops Flight Facility on the eastern shore of Virginia that doomed the mission bound for the International Space Station on Tuesday, October 28. The 14 story tall Antares rocket blasted off at 6:22 p.m. EDT from the beachside Launch Pad 0A at the Mid-Atlantic Regional Spaceport (MARS) at NASA Wallops on only its 5th launch overall. I witnessed and photographed the launch from the media viewing area on site at NASA Wallops from a distance of about 1.8 miles away. This story is being updated. See a gallery of photos herein. Everything appeared normal at first. But within about five seconds or so there was obviously a serious mishap as the rocket was no longer ascending. It was just frozen in time. And I was looking directly at the launch, not through the viewfinder of my cameras. Something was noticeably amiss almost instantly as the rocket climbed only very slowly, barely clearing the tower it seemed to me. The rocket failed to emerge from the normal huge plume of smoke and ash that’s purposely deflected away by the flame trench at the base of the pad. I was stunned trying to comprehend what was happening because it was all so wrong. It was absolutely nothing like the other Antares launches I’ve witnessed from the media site. I knew as a scientist and journalist that I was watching a mounting disaster unfolding before my eyes. Instead of ascending on an accelerating arc, a mammoth ball of fire, smoke and ash blew up the entire sky in front of us like a scene out of hell or war. Literally the sky was set on fire unlike anything I’ve ever witnessed. A series of mid air explosions rocked the area. I could feel a slight pressure wave followed by a mild but noticeable heat wave passing by. Then the rocket began to fall back to Earth. Then the ground blew up too as the rocket pieces hit the ground and exploded into a hail of smithereens in every direction. By this time our NASA escorts starting yelling to abandon everything in place and head immediately for the buses and evacuate the area. The ground fire spread mostly to the northern portion of the pad and the expanding air borne plume also blew northwards. The ground fire was still burning over a half hour later. Thankfully, everyone got out safe and there were no injuries due to the excellent effort by our NASA escorts trained for exactly these types of unexpected circumstances. It’s heartbreaking for everyone’s painstaking efforts to get to the point of liftoff after years of effort to fulfill the critical need to resupply that station with the science equipment and experiments for which it was built.